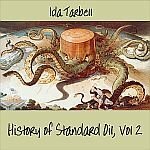 The History of the Standard Oil Company is a book written by journalist Ida Tarbell in 1904. It was an exposé of the Standard Oil Company, run at that time by oil tycoon John D. Rockefeller the richest figure in America’s history. Originally serialized in 19 parts in McClure’s magazine, the book was a seminal example of muckraking, and inspired many other journalists to write about trusts, large businesses that (in the absence of strong antitrust law in the 19th century) attempted to gain monopolies in various industries. The History of the Standard Oil Company was credited with hastening the breakup of Standard Oil, which came about in 1911. Note: This reading does not include any of the 36 Appendices.